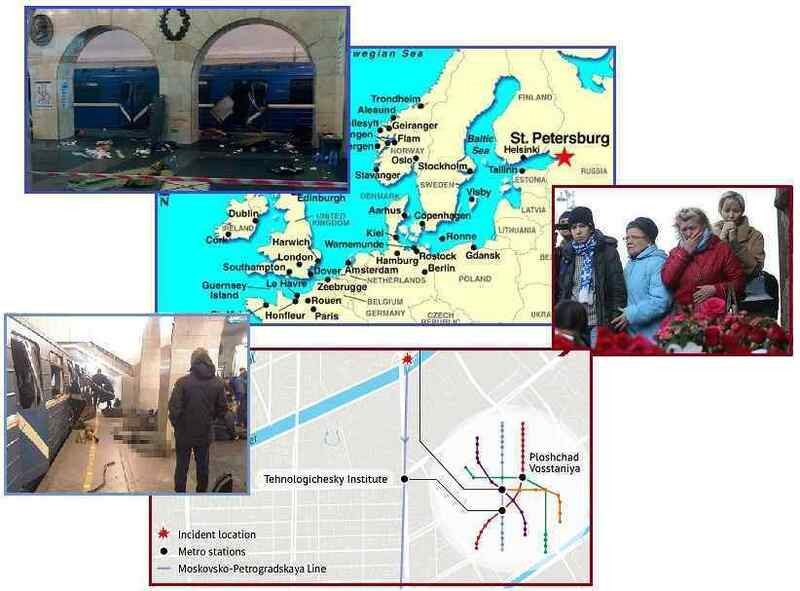 April 3, 2017. https://www.rt.com/news/383206-blast-metro-petersburg-russia/ An explosion in the St. Petersburg Metro has left at least 14 people dead and 51 injured. Russia’s Investigative Committee has launched a terrorist probe into the incident. Another explosive device has also been found and defused. [and from another] St. Petersburg Metro bomber, identified as 22yo Dzhalilov, planted another bomb. April 4, 2017 https://www.rt.com/news/383426-petersburg-suicide-attacker-identified/ The Russian Investigative Committee has identified 22-year-old Akbarzhon Dzhalilov, a Kyrgyz-born Russian citizen, as the suspect believed to have carried out the terrorist bombing in the Saint Petersburg Metro. According to the Investigative Committee, the same suspect planted a second IED at Ploshchad Vosstaniya station, which did not explode. Having lived in Atlanta, I know that the very wealthy, such as Newt Gingrich’s 6th District, live NORTH of Atlanta, in the Roswell section between I-400 and I-85. If Altanta were going to be vacated, suddenly, by people in a panic over news about Nibiru, for instance, they would be forced to take all roads except those leading to the rich enclaves! Was this an accident, or deliberate to sculpt migration? [and from another] https://en.wikipedia.org/wiki/Newt_Gingrich Representative, GA 6th District (1979–1999) [and from another] http://www.cnn.com/2017/03/30/us/atlanta-i-85-fire/ An elevated section of northbound Interstate 85, a major north-south artery for the Southeast, collapsed in Atlanta after a massive fire. All five lanes of the highway in each direction were blocked and will be closed for the foreseeable future. An estimated 250,000 vehicles drive daily through that stretch of I-85. [and from another] http://www.ajc.com/news/local/what-section-piedmont-road-closed-from-the-collapse/TQV9KnBZV56kkHRN06U7uI/ The Thursday evening fire happened on I-85 northbound just south of Ga. 400 near Piedmont Road. [and from another] http://www.godlikeproductions.com/forum1/message3492873/pg1 Why would somebody blow this up? Terrorism maybe, hurt the economy. If somebody did do it to hurt the USA, did they/would they, send a note to the media outlets to take credit? Who knows, they may be doing it and keeping quiet, but the authorities will catch them eventually, sooner the better. [and from another] Atlanta I-85 Bombing. April 4, 2017. http://imgur.com/a/bpiL7 The federally published fire codes and ratings undeniably prove it could not have happened any other way! 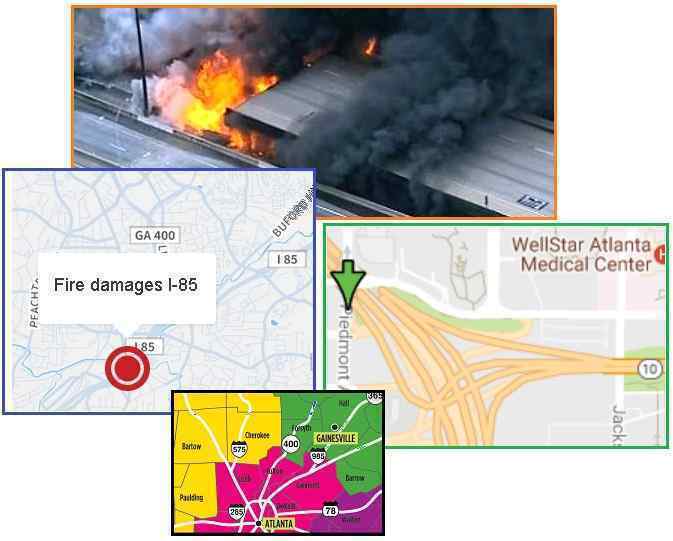 [and from another] I-85 Collapse: Three Arrested after Major Fire under Atlanta Highway. April 1, 2017. http://edition.cnn.com/2017/03/31/us/atlanta-interstate-85-fire-collapse/index.html A man has been arrested on suspicion of intentionally setting a huge fire that brought down part of an elevated interstate highway in Atlanta, a collapse that is expected to complicate traffic for months in one of the nation's most congested cities. 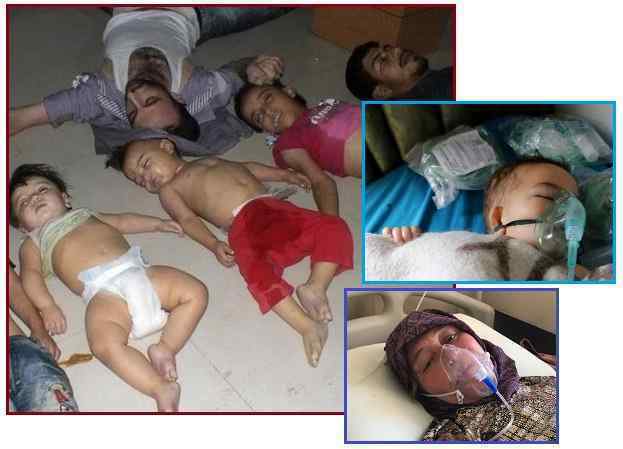 There was recently a gas attack on civilians in Syria. It has been blamed on Assad. However there was an article that suggests that this was in fact carried out by another group including the Clintons. Can the Zetas shed any light on the Nerve agent attack on civillians in Syria? [and from another] http://www.religionmind.com/2017/04/putin-elements-loyal-to-hillary-and-un.html Putin claims that the leak was intentionally planned by rebels to blame Assad regime and the mastermind behind the operation is Hillary Clinton. Bashar had no reason to gas his own people when he is winning the battle without much effort. Rebels are the one's who are loosing ground and are desperate. [and from another] https://www.infowars.com/report-soros-linked-group-behind-chemical-attack-in-syria/ A day prior to the attack, Gulf-based Orient TV announced “Tomorrow we are launching a media campaign to cover the airstrikes on Hama country side including the usage of chemical warfare against civilians.” This shows clear foreknowledge that the rebels were going to stage an attack by Orient TV. It is known 250 people were kidnapped last week from the nearby city of Hama, which is the same number as the current body count of wounded and killed civilians. According to award winning journalist Seymour Hersch, intelligence reports show the rebels smuggled in chemical weapons from Libya through Turkey with the approval of Hillary Clinton. ISIS is also known to be in possession of chemical weapons having conducted attacks on Syrian forces in Deir Ezzor. [and from another] http://www.cnn.com/2017/04/05/middleeast/idlib-syria-attack/ Survivors of a deadly airstrike in Syria have described chemical bombs being dropped from planes, in accounts that directly contradicted the Assad regime's version of a dawn attack that drew condemnation around the world. The White House and the UK blamed Syrian President Bashar al-Assad's regime for the attack that struck the rebel-held town of Khan Sheikhoun while many were still asleep. Amnesty International said evidence pointed to an "air-launched chemical attack." International agencies are investigating the origin of the agents used in the strike. At the United Nations, Western powers lambasted Russia for standing by the Syrian regime. [and from another] http://www.godlikeproductions.com/forum1/message3493714/pg1 FALSE FLAG: US announces removal of Assad is no longer a priority, 4 days later nerve gas attack is blamed on him. Seems awful convenient, doesn't it? The US announces it will no longer try to overthrow Assad. Four days later he allegedly does the only thing that could possibly change their minds. Using the "never let a good crisis go to waste" protocol, they turned it into a chemical attack by Assad, since there is probably forensic radar/satellite evidence of his jets dropping ordinance in the area at the time of the incident. [and from another] http://www.bbc.com/news/world-us-canada-39450570 The US representative to the United Nations has said that the US is no longer prioritizing the removal of Syrian President Bashar al-Assad. March 30, 2017. It appears that the US military has just attacked a military airfield and planes in Syria. Can the Zetas pleease tell us what's really going on? [and from another] http://fox59.com/2017/04/06/us-attacks-syrian-air-base-with-about-60-missiles-after-syrian-chemical-weapons-attack-ap-reportsf/ Trump and his top aides had acknowledged in recent days the “reality” of Assad being in power, saying his ouster was no longer a priority. But the chemical weapons attack seemed to spur a rethink. Secretary of State Rex Tillerson said of Assad: “There’s no role for him to govern the Syrian people.” [and from another] http://www.nbcnews.com/politics/white-house/trump-why-i-launched-missile-attack-syria-n743656 Two U.S. warships fired 59 Tomahawk missiles into the Shayrat Airfield near the Syrian city of Homs. That is the airfield Assad is believed to have used to undertake the attack that killed so many innocent civilians. "Either Russia has been complicit or simply incompetent in its ability to deliver," Tillerson continued. [and from another] http://newyork.cbslocal.com/2017/04/06/trump-syria-military-options/ The Trump administration called the chemical attack that killed 80 innocent civilians a serious matter than required a serious response. There were not Russian forces at this particular air field. An area of the base was used to house Russian personnel. 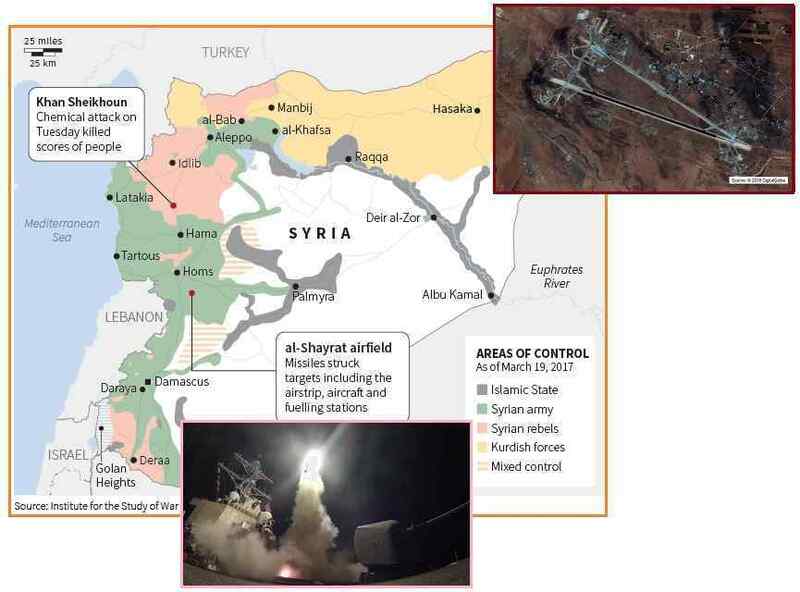 Russia was given advance warning of the strike, and the U.S. deliberately avoided the area of the base where the Russians live.